What would you write if no one knew who you were? 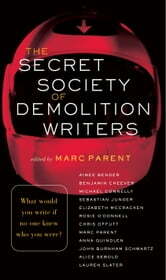 In the spirit of the demolition derby, where drivers take heedless risks with reckless abandon, welcome to the first convocation of the Secret Society of Demolition Writers. Here is a one-of-a-kind collection by famous authors writing anonymously–and dangerously. With the usual concerns about reputations and renown cast aside, these twelve daredevils have each contributed an extreme, no-holds-barred unsigned story, each shining as brightly and urgently as hazard lights. Unconventional and unapologetic*,* this publishing equivalent of a whodunit features an eclectic group of fictional characters, including a delusional schizophrenic narrator, an egg donor with second thoughts about her decision, a pharmacist who forms a weird crush on a woman who beat both of her parents to death, and a little girl who understands that an old safe is the threshold to another, ghostly, world. Equally diverse and surprising are the authors themselves: Aimee Bender, Benjamin Cheever, Michael Connelly, Sebastian Junger, Elizabeth McCracken, Rosie O’Donnell, Chris Offutt, Anna Quindlen, John Burnham Schwartz, Alice Sebold, Lauren Slater, and Marc Parent, the editor of the collection. Never before has such a wide-ranging and talented group of authors been assembled to such explosive and entertaining effect. 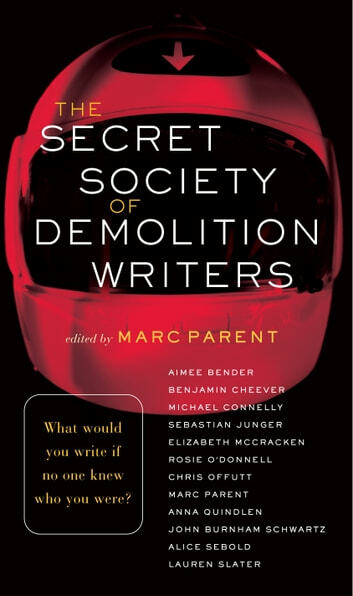 The Secret Society of Demolition Writers is an intriguing puzzle in itself, but it’s also an important addition to the careers of some of our finest storytellers–even if we never really know who wrote what. Its boundary-smashing fiction offers exhilarating proof that for an artist, withholding your identity can mean gaining your freedom.